Apparatjik and Audiokolor have collaborated on an installation at the exhibition ‘I wish this was a song’ at the Museum of Contemporary Art in Oslo. I WISH THIS WAS A SONG. MUSIC IN CONTEMPORARY ART is a large international group exhibition which opens at the Museum of Contemporary Art on 13 September. The exhibition fills the entire museum, and features 48 artists who work at the intersection between music and the visual arts. In the last 10 to 20 years, no other art form has had a greater influence on contemporary art than music, and today, many artists are working at the intersection between music and the visual arts. What strategies characterise these works? What effects do they attempt to evoke? How do they relate to the extensive legacy of aural and visual experiments left to us by the avant-gardists of the 1900s? And not least – is it possible to see any clear trends and/or common interests within this broad and diverse field? These were some of the questions that curators Stina Högkvist and Sabrina van der Ley wished to shed light on when they decided to create an exhibition about the place of music in contemporary art. The result is a large-scale exhibition of 83 works that fills the entire Museum of Contemporary Art, and which includes everything from paintings, drawings, sculpture and installations, to photography, video and pure sound. The exhibition has a strong international focus with artists from the USA, Sweden, Germany, Austria, the United Kingdom, Peru, Turkey, the Faroe Islands, Portugal, Sudan, Iceland, Canada, Ecuador, Denmark, Finland, Poland, Switzerland and the Netherlands. 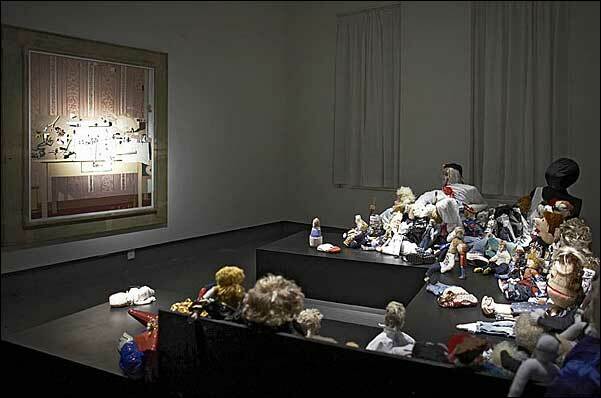 The exhibition also features figures from the Norwegian art scene, such as Tori Wrånes, Tom Sandberg, Terje Nicolaisen, Stian Eide Kluge, Camille Norment, Fadlabi and KILLL. The Apparatjik installation is located on the second floor of the Museum of Contemporary Art, and is called ‘Everybody is a composer’. It has its own room, which is darkened and has several speakers and security cameras mounted in the corners. 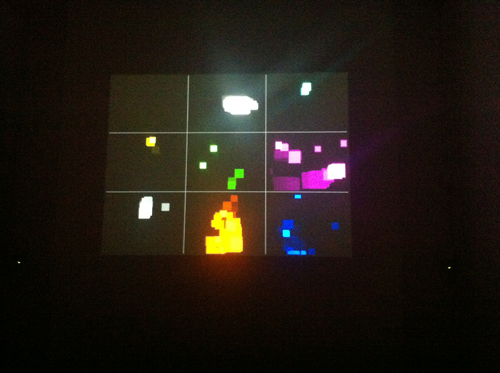 Movements are recorded and played back in sound, and also displayed in the form of moving squares/pixels on a screen. 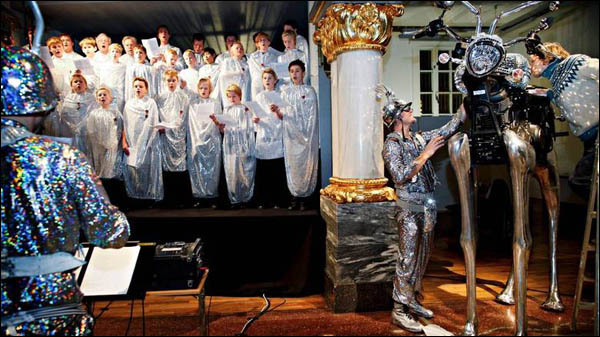 On December 11, the Oslo Boys’ Choir will perform a musical work composed as a result of the recorded movement in the gallery during the installation.